Over 20 years ago a friend’s mom made these awesome oat fudge bars, and she gave me the recipe. They were called Mrs. Larson’s bars, and they were awesome! This mom wasn’t named Mrs. Larson, and I have no idea who she is, but I love her bars. I hadn’t made these for many years, and I wanted to bring a treat to work the other day, so I pulled out the recipe. Having tried an chocolate oat fudge bar at Starbucks, I was curious about how similar their recipe was. I found a few recipes for imitation Starbucks Oat Fudge bars, and they all seem really close or exactly like this one. People at work all said these were better than Starbucks’ – but then homemade usually is, isn’t it? Because you know someone cared enough to take the time to bake for you. Lots of people at work asked for the recipe, so here it is! 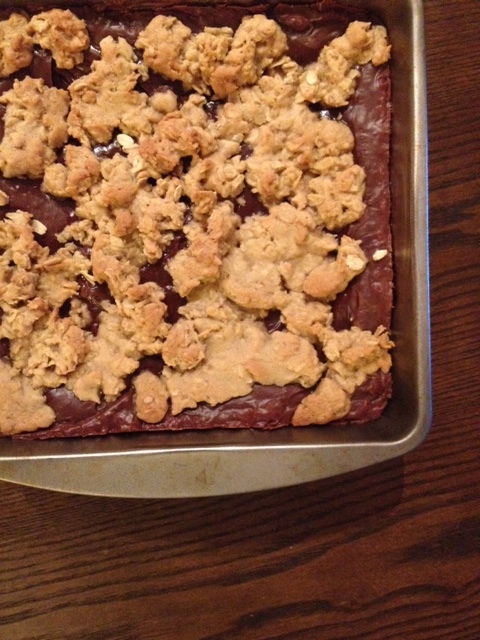 I changed the name from Oar Fudge Bars to Fudgey Oat bars, because let’s face it, we’re all here for the chocolate. 1. Prepare a 9 x 13 inch pan or two 8-inch pans by spreading a little butter in them. 2. Cream the butter and sugar well, then add the eggs and vanilla and beat well. Beat in the flour, baking soda and salt, then mix in the oats. Add about 2/3 of the batter to the pan, reserving the rest for the top. 2. Put all the ingredients in the top of a double boiler or in a bowl on top of a pot of water on the stove. Let it melt, then pour it on top of the base. 3. Add the rest of the base to the top of the chocolate mixture – I do this using my hands, to make sure none of the pieces are too big. 4. Pop it in the oven and bake for 20-22 minutes, when the top is getting a little browned. Let it cool, then slice away! Yum!